Remember Tall Stacks? Tom Browning's perfection? CINCINNATI -- This was a year that brought many significant moments to the residents of Cincinnati. We saw the birth of Fiona; the racially-charged retrial of former University of Cincinnati police officer Ray Tensing; the release and subsequent death of Otto Wambier, a prisoner of the North Korean government; and the local elections, to name a few. And while the new year brings new opportunities and events, it will also be a time to reflect on some of the major events from Cincinnati’s past that changed its future. It's something Brenda Johnson says she'll never forget. “I was caught in that blizzard on state Route 32. Couldn't see a thing past two feet in front of my car and even then it was horrific, but I crept slowly along till I got to my driveway but then I couldn’t get my car in it!” Johnson shared on a Facebook post. While snowfall over the course of the storm remained just under 7 inches, wind speeds and the resulting giant snow drifts shut down businesses and schools for days. Those who did venture out of their homes faced near zero-visibility, but some were more than willing to face the weather factors for a chance to fully experience the winter wonderland. The National Guard was activated in Ohio, Kentucky and Indiana. They helped clear roads, restore power, perform emergency rescues and deliver food and medicine along with transport medical personnel to hospitals, according to the National Weather Service. The storm was responsible for the deaths of 70 people in the Tri-State. Construction of Union Terminal was completed in 1933. Its art-deco style and iconic architecture immediately made Union Terminal a jewel in the Queen’s City’s crown. Upon its opening, the terminal, which unified seven different railroad lines, was heralded as a portal to the world. And though traffic was slow but steady to start, millions eventually passed through the building, many on their way to war. While plans for a large, modern train station in Cincinnati were first proposed at the start of the 20th century as a solution for the problems that plagued the seven existing railroad lines, the project was delayed by flooding, inter-railroad bickering and World War I until the late 1920s. Construction of the new terminal began in August 1929 and was completed in March 1933. The complete terminal facility included 22 separate buildings, 94 miles of track, almost 6 million cubic yards of fill, 224,500 cubic yards of concrete, more than 45,000 tons of steel and 8,250,000 bricks. The total cost for the project was $41 million. Soon after its opening, it was World War II that secured the train station’s place in history. After the United States entered WWII, the number of troops moving through the Union Terminal complex exploded, reaching a war time peak of 34,000 people per day in 1944. By war’s end, the facility had served millions of troops, service personnel and their families. 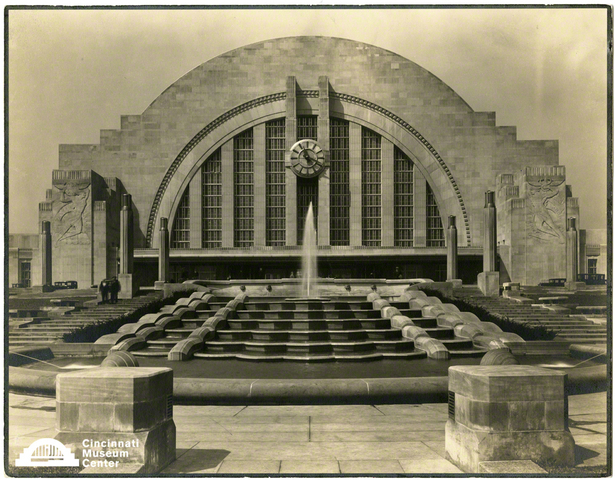 “In 1933, Union Terminal tremendously boosted in use, far more than what it was designed to handle. However, after World War II and the boost of automobile and air traffic, it saw declining usage,” said Scott Gampfer, associate vice president for collections & preservation. The rail station closed in 1972. The building has since served multiple roles, most notably as a mall and presently as home to the Cincinnati Museum Center. The massive rotunda, 180-feet wide and 106-feet tall, remains the second largest half dome in the world after the Sydney Opera House. 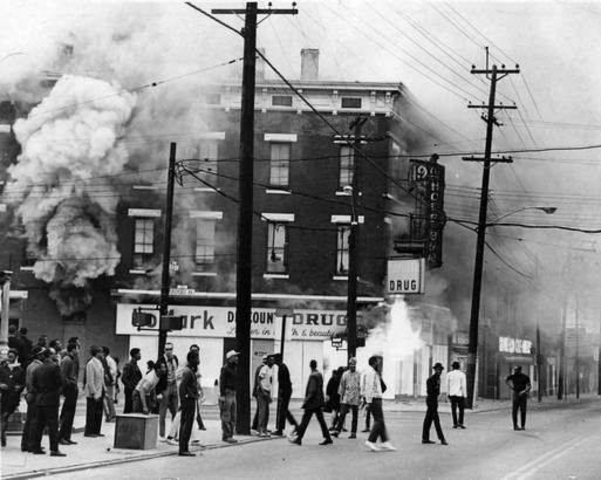 Race riots broke out in Cincinnati and across the country after the assassination of Dr. Martin Luther King Jr. in 1968. Like many cities across the country, Cincinnati felt the instant backlash of the assassination of Martin Luther King Jr. Most notably, violence broke out in the neighborhood of Avondale. Riots broke out on April 8, 1968, after a memorial was held at a local recreation center to honor King’s legacy. Rioters smashed store windows, looted merchandise and set dozens of fires. Noel Wright, a 30-year-old art instructor, was pulled from his car and fatally stabbed in Mount Auburn. His wife, Lois, was beaten. The next night, nearly 1,500 National Guardsmen were brought in to quell the violence. At its end, two were dead, more than 200 were injured, hundreds of others were jailed, and the city suffered $3 million in property damage. A community forum is scheduled for Jan. 11 at Cincinnati Christian University starting at 6 p.m. The event will include a presentation and group conversation on community problem oriented policing. A tin roof and poorly timed rain storms convinced a local businessman that Cincinnati deserved a better and more permanent structure to house its arts. Reuben Springer pledged half of the needed funding under the condition that the community raise the rest. The result was the iconic Cincinnati Music Hall, which was dedicated on May 14, 1878. “It was made possible not just by Springer’s philanthropy but by the community rallying together to building something extraordinary,” said Chris Pinelo, vice president of communications for the Cincinnati Symphony. More than a home for musicians, the majestic building quickly filled the role of convention center, housing a multitude of events throughout the years. Automotive competitions, boxing matches and even the 1880 Democratic National Convention were held in the Romanesque building. Though it was built to allow for the exhibition of the achievements of mechanics and craftsmen, the building and the people’s willingness to contribute to its success amplified the importance of the arts to the community. The story of its construction closely parallels that of the recent 16-month, $143 million renovation, which was made possible only through the generosity of the public. “It was built by the people and what we have inside is most definitely for the people,” said Pinelo. Today, Music Hall serves as the home for the Cincinnati Symphony Orchestra, Cincinnati Opera, May Festival Chorus and the Cincinnati Pops Orchestra. In January 1975, it was recognized as a National Historic Landmark by the U.S. Department of the Interior. It was a comeback story for the ages. Coming off a dismal 1987-88 season and the NFL strike, the Cincinnati Bengals roared to life in the 1988 season. Under Coach Sam Wyche, the team went undefeated at home and 4-4 on the road, earning the AFC Championship and a spot in Super Bowl XXIII. “This is why I'm a die-hard Bengals fan and bleed orange and black! The Super Bowl season of 1988 was captivating! This song takes me back to my sixth grade year! Makes me feel nostalgic,” fan Ryan Fairchild wrote on a Bengals’ fan page. It was the season that brought home the NFL Most Valuable Player Award (Boomer Esiason), NFL Offensive Lineman of the Year award (Anthony Muñoz) and six Pro Bowl selections (Esiason, Munoz, James Brooks, Max Montoya, Rodney Holman and David Fulcher). And while the season didn’t end with a Super Bowl win, it was the season that gave Cincinnati fans hope that it would happen someday. Tom Browning pitched a perfect game for the Reds in September 1988. The 1980s Cincinnati Reds were good but not great. They played in the shadow of The Big Red Machine. But on a rainy night in September 1988, they proved they could be perfect -- or at least their pitcher could. Tom Browning pitched the 12th perfect game in Major League Baseball history. The accomplishment was the highlight of the season, though few remained in the stadium to watch his accomplishment thanks to a two-hour and 27-minute rain delay, which caused the game to start near 10 p.m. Browning’s perfection made quick work of the Dodger’s 27 batters, and the game ended before midnight. “If you were to poll fans, no doubt Browning’s perfect game is the touchstone from that season. People still talk about it,” said Greg Rhodes, Cincinnati Reds’ historian. “It changed Tom’s life forever, in that he had done something no other Red had done, and something only a handful of pitchers have ever done. It would take perfection to score the highlight of a season that included the hosting of the 58th All-Star Game and then-manager Pete Rose’s infamous altercation with umpire Dave Pallone, which resulted in a 30-day suspension for Rose. The team finished the season 87-74, seven games back of eventual world champions Los Angeles Dodgers, the very team Browning skunked. In late 1988, while new technology was driving sales and entertainment around the globe, Cincinnati took a step back in time. Riverboats -- 14 in total -- dotted the Ohio River, providing the look and feel of the late 18th century. Tall Stacks, a blast-from-the-past festival held in 1988 to celebrate the bicentennial of Cincinnati, drew national attention and big crowds. More than 700,000 people crowded into the riverfront during the three-day event for a chance to see the historic boats and participate in the surrounding activities. Among the festivities was a race between the Delta Queen and Belle of Louisville, the same boats that race in Louisville in the days leading up to the Kentucky Derby. Additionally, visitors could speak with volunteers in period dress to ask questions about the boats, their importance in the settling of Cincinnati and what life was like in those early days. “Tall Stacks was the perfect event for 1988. It was one of several bicentennial events and is remembered as the legacy event of that year,” said Dan Lincoln, president and CEO of the Cincinnati USA Convention & Visitors Bureau. “Our Ohio River heritage is so important. The river shaped our city geographically, economically and culturally. Tall Stacks tied all of that together. In that sense, Tall Stacks was a celebration of the people and place of Cincinnati." A Xavier University study at the time stated that the first Tall Stacks had an economic impact of $30 million in 1988, Lincoln said. The popularity of the event convinced the planning committee to plan a repeat of the event. Subsequent festivals were held in 1992, 1995, 1999, 2003 and 2006. Under a silver dome on a small building in Mt. Lookout sits the birthplace of American astronomy. The Cincinnati Observatory was the first public observatory in the country and today houses one of the oldest working telescopes in the world. For 175 years, the center has inspired generations to look at the stars. The building, built using public funds raised through a door-to-door campaign, was dedicated in a ceremony presided over by former President John Quincy Adams. “We are thrilled to be celebrating the 175th anniversary of the laying of the cornerstone at our original location in Mt Adams, where the Monastery Event Center is currently located. We will be celebrating all year, with events in the spring to celebrate the first use of our Mitchel Scope, the oldest public telescope still in use in this hemisphere, as well as a 175th birthday party to celebrate the actual anniversary of the laying of the cornerstone on November 9, 1843,” said Anna Hehman, director of development. The observatory is home to scientific as well as educational resources. More than 12,000 students will visit the center this year, with an additional 18,000 people visiting the facility for public events, classes and fundraisers. The solar eclipse in 2017 introduced even more new faces to the observatory, proof that the sky's the limit when it comes to building interest in astronomy. Just 12 short years after the signing of the Declaration of Independence, settlers moving west from the original 13 colonies found a home along the Ohio River at the mouth of the Licking River. The land, which had been purchased by Israel Ludlow, Matthias Denman and Robert Patterson from John Cleves Symmes, was named Losantiville, a convoluted contraction of multiple languages meaning “city across from the mouth of the Licking River.” The name was soon changed to Cincinnati, a tribute to Roman citizen soldier Cincinnatus. The city grew slowly at first, claiming a population of only 700 after three years. The Ohio River, however, provided Cincinnatians with numerous opportunities and the city’s population grew exponentially. By 1890, Cincinnati was the largest city in Ohio. With a population of nearly 300,000, it boasted the highest population density in the country and had become a major industrial, political and arts center in the state and the country. From its meager beginnings, the city grew to become the Queen City.